Primary teeth stay in place until a permanent tooth comes in from underneath its position and pushes it out, taking it’s place in the mouth. Some children lose their primary teeth too early due to accidents or dental disease. When this is the case, a space maintainer may be recommended by your pediatric dentist to prevent space loss and future dental problems. 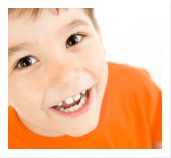 It is important to remember the fact that some teeth are not replaced until a child is 12 or 14 years old. Space maintainers are appliances made of metal or plastic that are custom fit to your child’s mouth. Most children adjust to them quickly. Without a maintainer, the teeth can tilt toward the empty space and cause permanent teeth to come in crooked. If left untreated, the condition may require future orthodontic treatment. Space maintainers hold open the empty space left by a lost tooth. They steady the remaining teeth, preventing movement until the permanent tooth takes its natural position. It is more affordable to keep teeth in their normal positions with a space maintainer than to move them back in place with orthodontic treatment. Please call Dr. Cima Mazar-Atabaki’s office in ALISO VIEJO today to schedule your child’s preventive consultation.